Looking for a way to bring your beverages to holiday parties? We have the perfect prize for you! 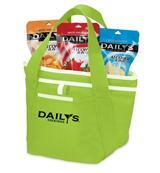 3, yes THREE, lucky winners will receive a tote from Daily's Cocktails! The tote does NOT include the alcoholic beverages seen here, but the tote itself is insulated and is the perfect way to travel with anything that needs to stay cool this winter! open to trying all .. I'd love to try the Pomegranate Margarita! I love the Pina coloda and would like to try the strawberry daquiri! Strawberry daquiri, I love the dailys!! Pina colada! Sounds delicious! They all do though.. the peach and strawberry sound so good too. I would like to try the Peach Daiquiri. I want to try the Pina Colada. I'd love to try the Pomegranate Margarita!! The Pina Colada one is awesome! I'd like the frozen lemonade. Thanks for the giveaway.